The dried bamboo shoots my mom brought back from Vietnam, and which I subsequently brought back from my $41.40 roundtrip flight to Portland, couldn't be used for just any ordinary dish. So, I saved one drumstick from my Thanksgiving turkey to make Bun Mang Ga Tay (Vietnamese Rice Vermicelli Noodle Soup with Bamboo Shoots and Turkey). Usually, this dish is made with duck, but any type of poultry will do. 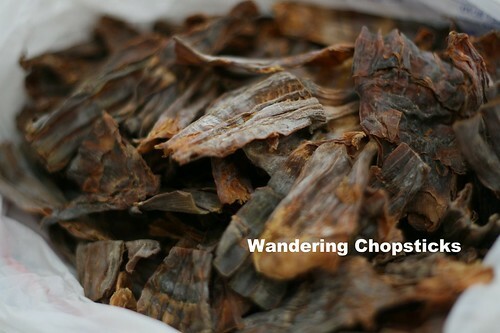 You may use fresh or dried bamboo shoots. If you're using the latter, depending on how much you like bamboo, you may need to boil and drain it off a few times to remove the pungent "earthiness." 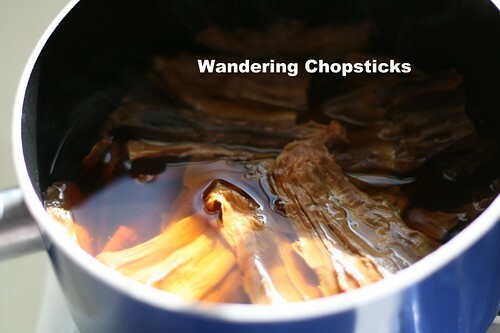 Personally, I love bamboo shoots so a quick boil to soften them was all that was needed. Since the turkey was already well-seasoned, I didn't add anything to the stock, but feel free to add salt and fish sauce as needed. 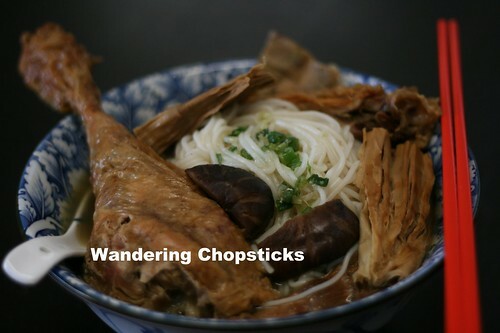 I threw in a few dried shiitake mushrooms as well, the earthiness of the mushrooms and bamboo, complementing each other. 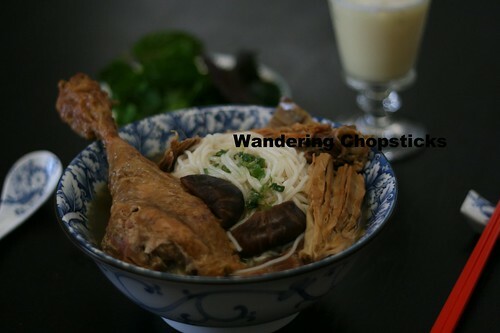 Then it was a simple matter of boiling rice vermicelli noodles and making an herb platter before assembling each bowl. Herb platter of your choice of mint, rau ram (Vietnamese coriander), cilantro, lettuce, etc. 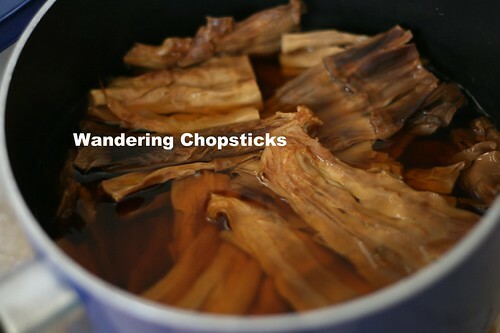 Dried bamboo shoots can be pretty pungent, if you don't like that, then you may need to boil and drain them off a few times until they're to your liking. You can also soak them overnight to start the softening process sooner. Meanwhile, soak the dried shiitake mushrooms in a bowl. And fill a 5-quart pot with water to boil the bamboo shoots. Personally, I like bamboo shoots, so I just boiled them once and let simmer for about 15 minutes. Drain off the water, rinse the bamboo shoots, and fill the pot again with about 4 quarts of water. Put the bamboo shoots back in the pot. Shred the turkey meat and set aside. In the pot, add the turkey bones, skin too since they have all that flavor, a large onion, and a stalk of lemongrass, slightly bruised to release the fragrance. Let simmer for about 45 minutes on medium-low heat. 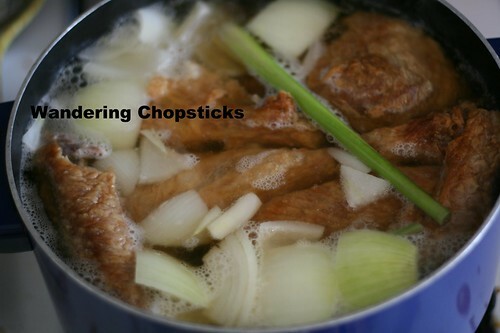 At about the half hour mark, snip off the ends of the shiitake mushrooms, cut them in half, and add them to the pot. 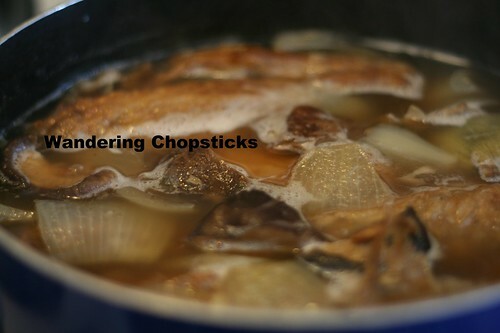 This is also a good time to taste the stock, and add salt, fish sauce, or soy sauce as needed. While the broth is simmering, pluck and wash the herbs and assemble a plate of them. When you're ready to eat, boil and drain the rice vermicelli noodles. 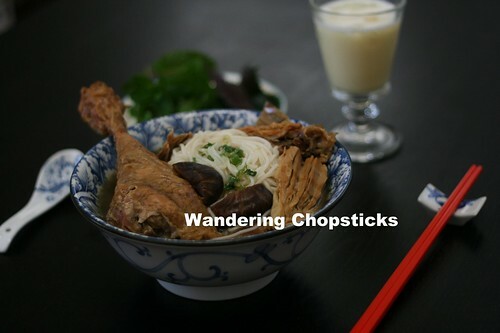 In a large bowl, add the noodles, turkey, shiitake mushrooms, and bamboo shoots. Ladle the broth over everything and serve with the herb platter. Perhaps with a refreshing glass of Soda Sua Hot Ga (Vietnamese Condensed Milk Egg Soda) like I did? 1 year ago today, Turkey Liver Pate. 2 years ago today, musings "On Glamour's "Engagement" Chicken and Who I Cook For." 3 years ago today, 8 random things about me. 4 years ago today, musings about food, family, and etiquette.